Read about 25 galleries, who will be presented at viennacontemporary for the first time. This year for the first time, galleries Christian Lethert and Hammelehle and Ahrens from Cologne will be present at the fair. Two more new entrants at viennacontemporary come from Paris: Bernard Bouche, who will bring three artistic positions to Vienna (Carlo Guaita, John Murphy, and José Pedro Croft) and Caroline Smulders with a solo presentation of Tokyo-born artist Kimiko Yoshida. Other newcomers from Western Europe include Boccanera from Trento and Anna Jill Lüpertz from Berlin. Stefan Lundgren Gallery from Palma de Mallorca/Spain will present two US artists, Luis Gispert and Jacolby Satterwhite, for the first time in Vienna. Further interesting new entrants come from the focus region Eastern Europe, such as up-and- coming Triangle Gallery from Moscow. Yay Gallery, which was founded in 2012, comes from Baku/Azerbaijan. Eastward Prospectus from Bucharest, which was only founded last year by Andrei Breahnă and Raluca Şoaita, will show a solo presentation of Marilena Preda Sânc at viennacontemporary. And for the first time, Fait Gallery from Brno/Czech Republic will join us in Vienna. The gallery Ambacher Contemporary, founded in 2004 by Horst Ambacher in Munich, primarily promotes contemporary and international mid-career artists with practices that often combine approaches to painting and sculpture, who´s positions refer to concrete-art, surrealism, naive art, figurative-informal as well as american realism. Gallery Ambacher Contemporary represents following artists: Sylvie Arlaud, Ernesto Canovas, Thomas Draschan, Frank Mayer, Tom Hackney, Otto Muehl, Armin Muhsam, Inge Pries, Daniel Schussler. Anna Jill Lüpertz Gallery, now located in Berlin on Postdamer strasse, was founded in 2010 by Anna Jill Lüpertz, who is a curator, project manager, art consultant and dealer. The project began as a temporary space/ moving gallery, as a concept that embraced a need for change, initiating the search for individualistic physical spaces to compliment the represented artists. In January 2013 gallery settled in a space located in a building of Alexander and Renata Camaro Foundation. Represents following artists: David Barbarino, Astrid Colomar, Pia Dehne, Bettina Ebel, Amir Fattal, Olaf Hajek, Harald Hermann, Daniel Kannenberg, Markus Kiebel, Will Kempkes, Robert Montgomery, Christine Rusche, Pietro Sanguineti, Pola Sieverding, Junior Toscanelli, Weltbrandt, Ian Hamilton Finlay, Lawrence Weiner. Boccanera Gallery was established in Trento in 2007. The founder and director is Giorgia Lucchi Boccanera. Gallery is aimed on discovering unknown artists and helping them to develop research towards a more mature conceptual complexity. The gaze has been gradually expanded towards the scenes of international experimentation, thanks to the involvement of young foreign curators. List of artists represented by the gallery includes Nebojša Despotović, Valentina Miorandi, Vlad Nanca, Marcos Lutyens, Walker Keith Jernigan, Justyna Kisielewska and Richard Loskot. Chimera-Project is a program-gallery founded 2013, representing Hungarian and foreign emerging artists. Through its Swiss-Hungarian founders the gallery operates on an international level and is dedicated to a professional thematic exhibition program. Chimera-Project represents 6 artists: Géza Perneczky, Adrián Kupcsik, Áron Kútvölgyi-Szabó, Gábor Koós, Tsuyoshi Anzai, Stano Masár. The Story of the Colorful Ribbons. Vol. 68., 1988, 2 plywood sheets, green ribbon, 40.5 x 28 cm. D+T Project Gallery was founded in 2010. It is run by by Gregory Thirion and Alexandre Daletchine. Focused on conceptual art, this gallery represents following artists: Ivan Argote, Elena Bajo, Stephan Balleux, Zachary Formwalt, Goldin+Senneby, Jens Haaning, Kristof Kintera, Federico Martinez Montoya, Hannu Prinz, Nicoline van Harskamp, Mona Vatamanu & Florin Tudor. Founded in 2014 by Andrei Breahnă, cultural manager, art dealer and art collector and Raluca Şoaita, architect and art collector, EASTWARDS PROSPECTUS is focused on the contemporary artistic production from (and upon) Eastern Europe. Ravzan Anton, Igor Bosnjak, Stefan Botez, Karolina Bregula, Floriama Candea, Radu Cioca, Sebastian Moldovan, Christian Paraschiv and Marilena Preda Sanc are represented by EASTWARD PROSPECTUS at the moment. Fait gallery was opened by initiative of Brno investor Igor Fait in 2012. It is a gallery institution that aims on artist’s solo projects and also allow the public to view private art collections. In addition to the main space, which is located in a former malt-house of a brewery and serves for exhibiting works from the collection of the gallery, Fait Gallery has opened up two other spaces: Fait Gallery MEM at the same address, which focuses on up-to-date activities of Czech and foreigner artists and organises 7 short-term exhibitions throughout the year, and Fait Gallery Preview, located in city center, which focuses on young emerging artists. Represented artists of the gallery are Tomáš Bárta, Kateřina Vincourová and Ondřej Homola. Bernard Bouche opened his gallery in Paris in 1994. The gallery aims to be recognised as a venue that shows high quality contemporary and conceptual work from international artists. Approximately four to five exhibitions are held each year; at the heart of the gallery programme is an emphasis on contemporary artists and on the rediscovery of historical figures. Among artist represented by the gallery are Michael Boulanger, Raphael Buedts, Antonio Calderara, Gianni Caravaggio, Joce Pedro Croft, Jean Degottex, Peter Joseph, Carlo Guaita, Bernd Lohaus, Charles Maussion, Jorge Molder, John Murphy, Pol Pierart, Bernard Rudiger, Susana Solano, Pierre Tal-coat, Marc Triver and Michele Zaza. Head of International Market for the Daniel Templon gallery from 1986 to 1989, head of the Art Program and architecture to the Caisse des Dépôts from 1990 to 1991, director of the gallery Thaddaeus Ropac Paris from 1992 to 2002, director of the Contemporary department of Christie’s France from 2002 to 2006, Caroline Smulders founded her gallery in 2007. Caroline Smulders represents a narrow team of artists in France or abroad, which includes Anee Mann, Madeleine Berkhemer, Céline Cléron, Gérard Fromanger, Marion Lachaise, Gerard Malanga, Lucy+Jorge Orta, Jean Pierre Raynaud, Emmanuel Régent, Pascale Simont, Skall, Veronika Veit, Kimiko Yoshida. Founded in August 2006 in Cologne by Christian Lethert. This gallery pursues a clear concept of reduced and abstract positions in Contemporary Art, referring to painting, sculpture and photography. Five to six times a year the gallery presents interesting single and group exhibitions, combined with a supporting program of lectures and controversy. Galerie Christian Lethert represent following artists: Jill Baroff, Rana Begum, Nelleke Beltjens, Henrik Eiben, Fergus Feehily, Lutz Fritsch, Joe Fyfe, Frank Gerritz, Hubert Kiecol, Imi Knoebel, Gereon Krebber, Daniel Lergon, Kai Richter, Winston Roeth, Max Sudhues. The gallery was founded in January 1994 in Stuttgart as a showroom for young fresh art by the former art students Bernd Hammelehle and Sven O. Ahrens. In 2002 gallery moved to Cologne and established there the gallery building together with Luis Campaña, Vera Gliem and Sabine Schmidt. The gallery works as an interface for young upcoming art and established positions of the 1990’s with clear concepts in painting, sculpture, new media and installation. Today Galerie Hammelehle und Ahrens represents 17 artists: Thomas Arnolds, Lutz Driessen, Thomas Grötz, Tine Furler, Stephan Jung, Isabel Kerkermeier, Ulrich Lamsfuß, Markus Oehlen, Thomas Rentmeister, Andreas Rüthi, Jan Scharrelmann, Matthias Schaufler, Anja Schwörer, Vincent Tavenne, Ina Weber, Jens Wolf and Daniela Wolfer. Gallery Nicola von Senger AG was created in 2005 by Nicola von Senger in Zurich. This gallery aims to attend to its artists personally and in the long term, to build up networks, and to exhibit its artists periodically every two to three years. Beni Bischof, Olaf Breuning, Buetti, Dejanoff, Saskia Edens, Thomas Feuerstein, Tom Fellner, Gelitin, Lori Hersberger, Elke Silvia Krystufek, Gianni Motti, Martin Parr, Drago Persic, Augustin Rebetez, Mario Sala, Arcangelo Sassolino, Simon Senn and Till Velten are represented by Galerie Nicola von Senger. The gallery was founded in 1996 by the art historian Jörk Rothamel. Galerie Rothamel is located in two offices in Erfurt and Frankfurt am Main and represents established positions and also aspiring artists. The gallery publishes numerous catalogs, works regularly with museums, exhibits at art fairs and represent following artists: Axel Anklam, Nabil El Makhloufi, Jörg Ernert, Harald Reiner Gratz, Jochen Görlach, Moritz Götze, Eckart Hahn, Dana Meyer, Michiko Nakatani, Nguyen Xuan Huy, Wieland Payer, Rodion Petrov, Hans-Christian Schink, Annette Schröter, Ulrike Theusner, Thitz, Raissa Venables. The Kasia Michalski Gallery is a commercial exhibition space focused on contemporary art and photography from Poland and abroad, was created by Kasia Michalski in March, 2015. It functions as a stepping stone for emerging and mid-career artists to share, promote and sell their creations outside the sometimes unapproachable boundaries of the art world. While the gallery runs a core white cube exhibition space, it also functions as a cultural meeting point where visitors can learn about and enjoy creativity within an accessible framework. List of represented artists as of March 2015: Maurice Schobinger, Jurek Wajdowicz, Katarzyna Mirczak, Damir Očko, Agnieszka Brzeżańska. Loock Gallery was founded in 1988 in Berlin-Mitte as Gallery Wohnmaschine, where Friedrich Loock began showing art in his private apartment in former East Berlin, thus combining aspects of living, working, and art production. In 2008 the gallery moved to a 4300 sq ft space next to the Museum Hamburger Bahnhof, changing the name to Galerie Loock in order to reflect the gallery’s conceptual evolution. Since April 2013 the Gallery is based in Potsdamer Straße 63. Loock Galerie represents Ivan Grubanov, Anton Henning, Leiko Ikemura, Callum Innes, Michael Kalmbach, York der Knoefel, Noguchi Rika,Takehito Koganezawa, Rei Naito, Peter Rösel, Alec Soth, Natalia Stachon, Yoshihiro Suda, Gavin Tremlett, Kaoru Usukubo, Charlie White, Miwa Yanagi, Holly Zausner, Jonathan VanDyke. The gallery was established in 2005 by Martin Asbæk (b.1975) in Copenhagen and focuses on contemporary Scandinavian as well as international art by well-established and up-coming artists who work in a wide range of media; painting, drawing, sculpture, photography, video, embroidery. Martin Asbæk Gallery participated in many art fairs in Europe and USA for instance Paris Photo, VOLTA NY/ Basel, The Armory Show NY, Art Brussels. List of artists: Tjorg Douglas Beer, Niels Bonde, Elina Brotherus, Jesper Carlsen, Berta Fischer, Nicolai Howalt, Astrid Kruse Jensen, Eva Koch, Martin Liebscher, Soren Martinsen, Paul Mcdevitt, Sofie Bird Møller, Conrelius Quabeck, Hans Hamid Rasmussen, Maria Rubinke, Matt Saunders, Lisa Strombeck, Trine Sondergaard, Ebbe Stub Wittrup, Clare Woods. MARTINETZ focuses on young emerging art. A special emphasis is put on transmedial working artists who preferentially cover the field of performance, video or soundinstallation. MARTINETZ represents artists from Austria, Germany, Israel, Luxembourg and Poland. The gallery was founded 2015 by Petra Martinetz and is based in the center of Cologne, Germany. Artists represented by the gallery: Christian Eisenberger, Amir Fattal, Christian Keinstar, Albert Mayr, Thomas Palme, Evamaria Schaller, Tina Schwarz. In May 2014 Salvatore Viviano opened the One Work Gallery in Vienna. The main concept of the One Work Gallery is to present only one work at a time. Gallery stands for specific abstraction and abstract specificity. Every artist of the gallery is unique. One Work Gallery shows ultra-contemporary art and rare jewels from the past. Photon – Centre for Contemporary Photography was established in 2003 in order to present and promote the artists from the Central and especially Southeast Europe, who are in particular engaged in the field of contemporary art photography and art video. Photon is a member of EMoP. In 2013 Photon has expanded its activities abroad and opened a gallery space in Vienna. This gallery represents: Goran Bertok, Roman Bezjak, Gabriella Csozso, DK, Anna Fabricius, Gyula Fodor, Markis Guschelbauer, Gabor Kerekes, Peter Kostrun, Roberto Kusterle, Marko Lipus, Stane Jagodic, Paula Muhr, Borut Peterlin, Eva Petric, Aniko Robitz, Aleksander Valchev and Sandra Vitaljic. Propaganda Gallery, based in Warsaw, is dedicated to the promotion of Polish and Israeli art and their integration to the international art context. Founded in 2007 as appendix2 gallery by renowned art critic and curator Paweł Sosnowski have since featured over 30 shows. In 2010 appendix2 moved to a new location at Foksal Street in Warsaw centre merging its activities with Propaganda Foundation and henceforth acquiring the name of Propaganda Gallery. Tomasz Kulka, Jakub Ciężki and Adam Jastrzębski are represented by Propaganda Gallery. Richard Saltoun is a London-based gallery specializing in post-war art with a particular interest and emphasis on conceptual, feminist and performance artists that emerged during the 1970s. The gallery has been at the forefront of reintroducing and promoting the work of exceptional artists from the 1970s such as Helen Chadwick, Bob Law, and Jo Spence. Richard Saltoun has worked with and exhibited leading Feminist artists including Renate Bertlmann, Helen Chadwick, Rose English, Alexis Hunter, Valie Export, Friedl Kubelka, Gina Pane, Carolee Schneemann and Jo Spence, all of whom used their art to express and reflect the social turbulence of the times. Richard Saltoun represents the estates of Helen Chadwick, Bob Law, Jo Spence and Shelagh Wakely. Mallorca Landings was founded as a gallery in 2011 by Pärnilla and Stefan Lundgren, and currently represents 16 artists, emerging but also established, mostly belonging to a younger generation. The program’s focus is on interdisciplinary, concept-oriented and space based approaches in a variety of media: including sculpture, photography, painting, drawing, video, sound and performance. Since September 2013 Mallorca Landings changed name to Stefan Lundgren Gallery when opening a new second space on C. Tomas Forteza 55 which works as our gallery show room. Represented artists: Metthew Brandt, Gerald Davis, Luis Gispert, Devin Kenny, Rannva Kunoy, Justin Lieberman, Roman Liska, Carter Mull, Nathlie Provost, Christopher Richmond, Ry Rocklen, Jacolby Satterwhite, Amba Sayal-Bennett, Kate Steciw, Andrew Sutherland, Jennifer West. Triangle Gallery was founded in 2015 on the territory of Winzavod Centre for Contemporary Art by Nadia Stepanova and later on she was joined by art dealers: Elvira Tarnogradskaya and Alisa Baldeschi. Valery Chtak, Polina Kanis, Liudmila Konstantinova, Kirill Kto, Evgheny Kukoverov, Sasha Kurmaz, Sasha Pirogova and Pavel Ziumkin are represented by Triangle Gallery at the moment. Gallery unttld contemporary was founded in Spring 2014. 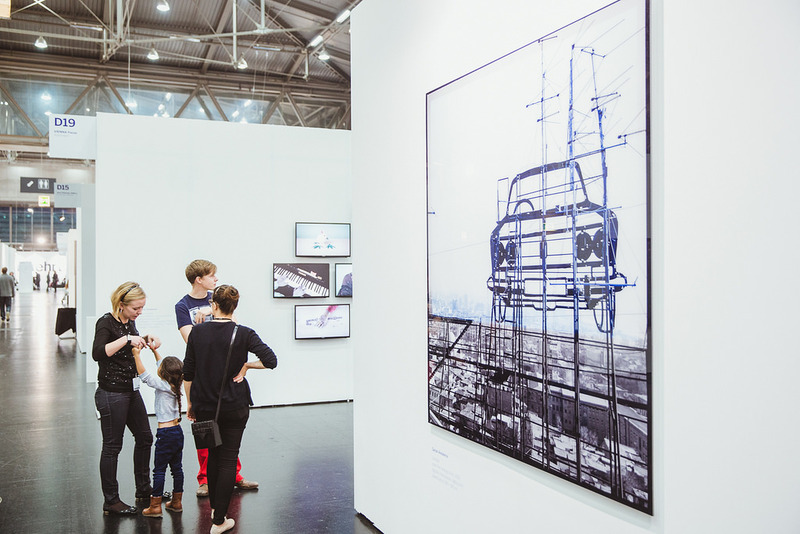 Represents following artists: Alfredo Barsuglia, Josef Bauer, Roxane Boroujerdi, Daniel Domig, Christian Egger, Sofia Goscinski, Caroline Heider, Lukas Janitsch, Paul Leitner, Thomas Wagensommerer. Yay Gallery is the leading contemporary art gallery in Azerbaijan, representing pioneering Azerbaijani artists across several generations and genres. Since being founded in Baku in 2012, it has championed the careers of key Azerbaijani artists who have gained international recognition in recent years including Farid Rasulov, Rashad Alakbarov, Aida Mahmudova, Faig Ahmed, Orkhan Huseynov and Reza Hazare. Located in the heart of Baku’s Old City, Yay Gallery sits amongst designated UNESCO world heritage sites. The gallery was founded by YARAT Contemporary Art Space, a non-profit contemporary art organisation, as part of their commitment to support the infrastructure for art in Azerbaijan. Tags: Adam Jastrzebski, Adnan, Adrián Kupcsik, AES+F Tatiana Arzamasova, Agnieszka Brzeżańska, Aida Mahmudova, Albert Allgaier, Albert Mayr, Alec Soth, Alexis Hunter, Alfredo Barsuglia, Alisa Bagdonaite, Amba Sayal-Bennett, Ambacher Contemporary, Amir Fattal, Andreas Rüthi, Andrew Sutherland, Anee Mann, Anja Schwörer, Anna Jill Lüpertz Gallery, Annette Schröter, Anton Henning, Antonio Calderara, Arcangelo Sassolino, Armin Muhsam, Astrid Colomar, Astrid Kruse Jensen, Attila Stark, Augustin Rebetez, Axel Anklam, Áron Kútvölgyi-Szabó, Balet Balcinovic, Beni Bischof, Bernard Bouche, Bernard Rudiger, Bernd Lohaus, Bernhard Garnicnig, Bert Löschner, Berta Fischer, Bettina Ebel, Boccanera, Borsos Lőrinc, Buetti, Callum Innes, Carlo Guaita, Carolee Schneemann, Caroline Heider, Caroline Smulders, Carter Mull, Cäcilia Brown, Céline Cléron, Charles Maussion, Charlie White, Chimera Project, Christian Egger, Christian Eisenberger, Christian Keinstar, Christian Lethert, Christian Paraschiv, Christine Rusche, Christoph Meier, Christopher Richmond, Clare Woods, Conrelius Quabeck, contemporary art, D+T Project Gallery, Damir Očko, Dana Meyer, Daniel Domig, Daniel Ferstl, Daniel Kannenberg, Daniel Lergon, Daniel Schüßler, Daniel Schussler., Daniel Templon, Daniela Wolfer, David Barbarino, Dejanoff, Devin Kenny, Drago Persic, Eastwards Prospectus, Ebbe Stub Wittrup, Eckart Hahn, Elena Bajo, Elina Brotherus, Elke Silvia Krystufek, Elvira Tarnogradskaya, Emmanuel Régent, Erika Baglyas, Ernesto Canovas, Eszter Szabó, Eva Koch, Evamaria Schaller, Evgeny Svyatsky, Evgheny Kukoverov, Faig Ahmed, Fait Gallery, Fait Gallery MEM, Fait Gallery Preview, Farid Rasulov, Federico Martinez Montoya, Floriama Candea, Frank Gerritz, Frank Mayer, Friedl Kubelka, Galerie Bernard Bouche, Galerie Caroline Smulders, Galerie Christian Lethert, Galerie Hammelehle und Ahrens, Galerie Nicola von Senger, Galerie Rothamel, Gábor Erdélyi, Gábor Koós, Gérard Fromanger, Géza Perneczky, Gelitin, Gerald Davis, Gerard Malanga, Gerhard Himmer, Gianni Caravaggio, Gianni Motti, Gina Pane, Goldin+Senneby, Gregory Thirion, Hannu Prinz, Hans Hamid Rasmussen, Hans-Christian Schink, Harald Hermann, Harald Reiner Gratz, Helen Chadwick, Holly Zausner, IAN HAMILTON FINLAY, Igor Bosnjak, Imi Knoebel, Ina Weber, Inge Pries, Isabel Kerkermeier, Ivan Argote, Ivan Grubanov, Jacolby Satterwhite, Jakub Ciezki, Jan Scharrelmann, Jörg Ernert, Jean Degottex, Jean Pierre Raynaud, Jennifer West, Jens Haaning, Jens Wolf, Jesper Carlsen, Jo Spence, Joce Pedro Croft, Jochen Görlach, Johanna Binder, John Giorno, John Murphy, Jonathan VanDyke, Jorge Molder, Josef Bauer, Judith Eisler, Junior Toscanelli, Jurek Wajdowicz, Justin Lieberman, Justyna Kisielewska, Karolina Bregula, Kasia Michalski Gallery, Katarzyna Mirczak, Kate Steciw, Kateřina Vincourová, Kimiko Yoshida, Kirill Kto, Kristof Kintera, Ladislav Postupa, Lawrence Weiner, Lev Evzovich, Lisa Strombeck, Liudmila Konstantinova, Loock Galerie, Lori Hersberger, Lucas Zallmann, Lucy+Jorge Orta, Luis Gispert, Lukas Janitsch, Lukas Thaler, Lutz Driessen, Madeleine Berkhemer, Magda Wegrzyn, Manfred Hubmann, Marc Triver, Marcos Lutyens, Maria Rubinke, Marianne Vlaschits, Marilena Preda-Sanc, Mario Sala, Marion Lachaise, Markus Kiebel, MARKUS OEHLEN, Martin Asbaek Gallery, Martin Liebscher, Martin Parr, MARTINETZ, Maruša Sagadin, Matt Saunders, Matthias Schaufler, Maurice Schobinger, Metthew Brandt, Michael Boulanger, Michael Kalmbach, Michele Zaza, Michiko Nakatani, Miwa Yanagi, Mona Vatamanu & Florin Tudor, Moritz Götze, Nabil El Makhloufi, Nadia Baldeski, Nana Mandl, Natalia Stachon, Nathlie Provost, Nebojša Despotović, Nelleke Beltjens, Nguyen Xuan Huy, Nicolai Howalt, Nicoline van Harskamp, Niels Bonde, NOGUCHI Rika, Olaf Breuning, Olaf Hajek, Ondřej Homola, One Work Gallery, Orkhan Huseynov, Otto Muehl, Pascale Simont, Paul Leitner, Paul Mcdevitt, Pavel Ziumkin, Péter Koppányi, Peter Aerschmann, Peter Joseph, Peter Rösel, Petr Kvíčala, Philipp Fleischmann, Photon Gallery, Pia Dehne, Pierre Tal-coat, Pietro Sanguineti, Pol Pierart, Pola Sieverding, Polina Kanis, Propaganda, Radu Cioca, Raissa Venables, Rana Begum, Rannva Kunoy, Raphael Buedts, Rashad Alakbarov, Ravzan Anton, Rei Naito, Renate Bertlmann, Reza Hazare, Richard Loskot, Richard Saltoun, Robert Montgomery, Roberto Kusterle, Rodion Petrov, Roman Liska, Rose English, Roxane Boroujerdi, Ry Rocklen, Salvatore Viviano, Sarah Pichlkostner, Sasha Kurmaz, Sasha Pirogova, Saskia Edens, Sébastien Délire, Sebastian Moldovan, Sibylle Bergemann, Simon Senn, Skall, Sofia Goscinski, Sofie Bird Møller, Soren Martinsen, Stane Jagodič, Stano Masár, Stefan Botez, Stefan Lundgren, Stefan Lundgren Gallery, Stephan Balleux, Stephan Jung, Susana Solano, Sylvie Arlaud, Takehito Koganezawa, Thitz, Thomas Arnolds, Thomas Draschan, Thomas Feuerstein, Thomas Grötz, Thomas Palme, Thomas Rentmeister, Thomas Wagensommerer, Till Velten, Tina Schwarz, Tine Furler, Titania Seidl, Tjorg Douglas Beer, Tom Fellner, Tom Hackney, Tomasz Kulka, Tomáš Bárta, Toni Schmale, Triangle Gallery, Trine Sondergaard, Ulrich Lamsfuß, Ulrich Wüst, Ulrike Theusner, unttld contemporary, Ute Müller, Valentina Miorandi, Valery Chtak, valie export, Veronika Veit, Vincent Tavenne, Vlad Nanca, Vladimir Fridkes, Walker Keith Jernigan, Weltbrandt, Wieland Payer, Will Kempkes, Winston Roeth, YARAT Contemporary Art Space, Yay Gallery, York Knoefel, Yoshihiro Suda, Zachary Formwalt. Bookmark the permalink.